I’ve worked on a logo for the work I do, and those that partner with me, while lying in bed. The feeling in my fingers is slowly returning, post first chemo infusion. The Creative Call in Seattle can use the logo for name tags, etc. I’ve had a hard, hard few days post chemo infusion, which occurred last Friday. My chest continues to ache with a deep ache that is hard to describe. I can only hope the chemo is shrinking lesions in my lungs, and the pain is all worth it. Today, I got up a bit more, and I even had a 15 minute walk in the neighborhood. My daughter, Katie, kindly carried my oxygen, and I slowly trudged up and down tiny grades in the pavement. I mentioned to Katie that the declines in the road were glorious. It’s the little gifts in life that mean a lot when one is fighting stage four cancer, especially in hilly Colorado Springs. 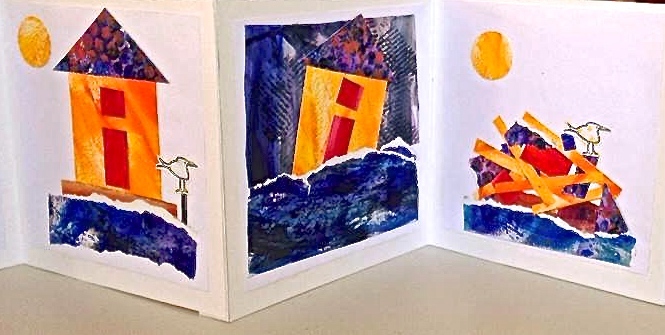 I wanted to share with you the rest of my collaged art book from my last posting – the house built on the rock and the house built on the sand. Here, below, is the house built on the sand – a truly poor foundation. During the storms of life, what will we base our lives on and what will help us endure?